I have 2 friends on the panel that I am so proud of. Please cast your votes below. Mom of 3 lost 11 lbs in just 21 DAYS! After three children and turning 40 years old, I thought that frumpy was 'as good as it gets.' I was wrong! I lost 11 lbs and 8.5 inches with 21 Day Fix. I feel more confident, and I have been amazed at what my body can do! Tell us about your life before you started the program. How did you feel about yourself and your body? 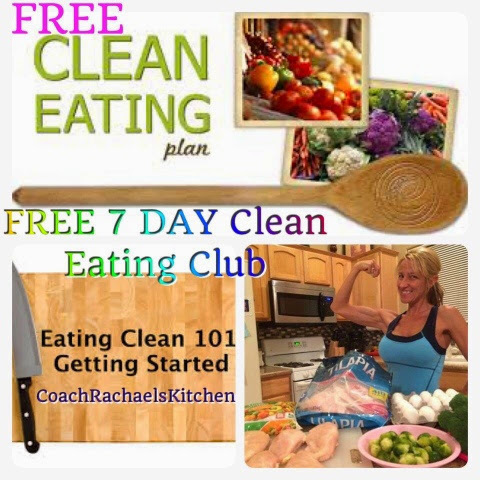 * Before I started the 21 Day Fix program I felt discouraged and defeated by food. I am a person in recovery (lifetime) for an eating disorder. My mental image of what portions "should" look like and how many I "should" have is distorted. I went back and forth between not eating enough to binging and beating myself up afterward. After three children and turning 40 years old, I never thought that my body could look like it does again. I had been working out regularly in fitness classes in the gym for years, but I seemed to have reached a plateau. I thought that frumpy was "as good as it gets". I was wrong! What inspired you to change your life and begin your transformation journey? * I was inspired to change my life and my body by several factors. I am a mother of three beautiful children, one of whom was born with a congenital heart defect. He underwent emergency open heart surgery after suffering a heart attack at just 6 weeks of age. He is fully recovered now and lives a healthy 3-year-old life with the help of medication, but I wanted to make sure that I was the CHANGE in the way my family saw nutrition. I wanted to show my children the RIGHT way to eat and be healthy instead of the obsessing and fad dieting that I had done for the majority of my life as a person who struggles with an ED and distorted body image. I made the decision that I was NOT going to project that onto my children. What is the greatest challenge you faced before beginning the program? How did the program and Beachbody® help you overcome that challenge? * The greatest challenge I faced at the beginning of the program was changing my mindset to workout at home. I dismissed the videos, thinking, "They can't be that hard, it is 30 minutes." Boy was I wrong! Despite the fact that I had been working out consistently in the gym for years, my body was sore in places I had never worked before. My transformation was quick, and it was amazing! I can't wait to start other Beach Body programs! What in particular did you like about the program you chose? * The absolute best part of the 21 Day Fix program is the meal plan and the containers. Not only does the plan tell me WHAT to eat, but it tells me how MUCH to eat of each thing. The containers helped me to see what I was doing wrong, and it is easier to manage my diet now without feeling like I have to measure and weigh and count everything. Describe the results you achieved with your Beachbody program. Which achievements are you proud of? 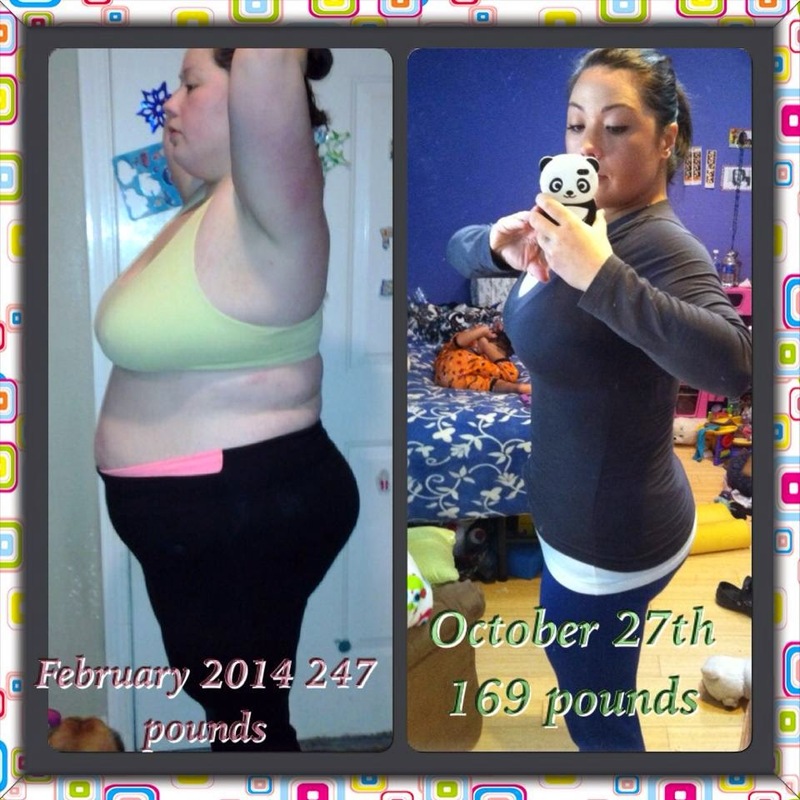 * I lost 11 lbs and 8 1/2 inches with 21 Day Fix. The achievement I am most proud of is the way that I feel on the INSIDE! I feel more confident, and I have been amazed at what my body can do! How has your life changed since completing your Beachbody program? * My life has changed in a positive way since finishing 21 Day Fix. I became a coach and am running challenge groups of my own. I look more forward to their weigh in days than my own! I love to share this with others and I enjoy the fulfillment that comes from watching them reach their goals one by one. Since completing 21 Day Fix I have started PiYo, which I absolutely love. I have registered to become PiYo certified, and that has given me the confidence to start the process of becoming certified to instruct Les Mills Body Pump, which I have been doing at my gym for four years. I can help others, and by doing so I help myself. I love this! How did participating in a Challenge Group help you reach your goals? How did your group support you and keep you accountable? My challenge group was amazing. We had members on both coasts, so I woke up to text messages in group that my co-challengers had already knocked out their workout for the day. That was very motivating! We checked in throughout the day, and my group motivated me to push play even when I had a million excuses not to...too tired, too busy...to sore. No! We kept each other accountable and worked our program together. We shared recipes and tricks to making the most out of our 21 Day Fix containers. We shared Shakeology recipes and ideas. It was absolutely key to my success. 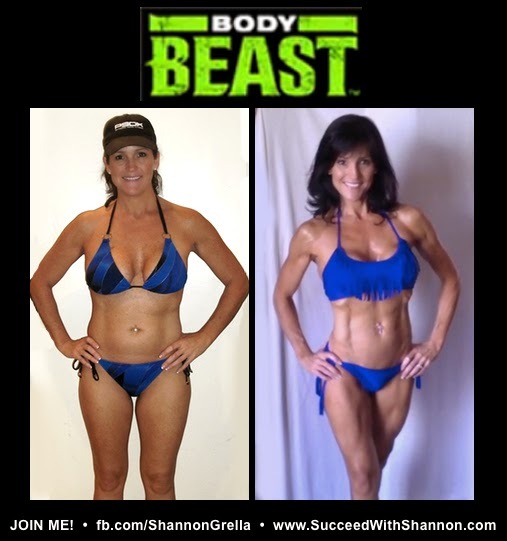 How did a Beachbody Supplement or Nutritional Product or Program (such as Shakeology® or Beachbody Ultimate Reset®) support your transformation? What are the greatest benefits you gained? Did you see benefits to your energy, sleep, mood/mental clarity, digestion/regularity? I used Shakeology during my challenge. I will be honest in saying that at first I thought it was ridiculously expensive for protein powder that I could get at the nutrition store for a fraction of the cost. But the challenge pack made the Shakeology worth my while to try. I experienced increased energy and help with my cravings! My Shakeology quickly became my favorite meal of the day, and then my husband started drinking mine. He now has his own HD and we absolutely love the product. Lost 87 lbs. in 9 months! I was 265 pounds and so depressed and hopeless. But, after my first workout with the 21 Day Fix, something just clicked with me. I remember feeling excited and hopeful and empowered that I was able to do this new workout and actually loved it! I've lost 87 pounds in 9 months! And I'm still going!!! Tell us about your life before you started the program. How did you feel about yourself and your body? * I was 265 pounds and so depressed and hopeless. I was in a lot of pain physically and I felt like a horrible mother because I couldn't get up and play with my daughter. I wouldn't leave the house. I just stayed at home and sat in my recliner all day long. Every day was the same. I was so ashamed of my body that I would not let anybody see me. What is the greatest challenge you faced before beginning the program? How did the program and Beachbody® help you overcome that challenge? * I didn't believe in myself, and I was in pain. I had done slim in 6 in the past with a friend, so the fact that it was familiar to me really helped me to be open to trying it again. I knew that the program worked , I just had to make the choice to start. When I decided to try the 21 day fix, it was a stranger to me. But after my first workout with Autumn, something just clicked with me. I remember feeling excited and hopeful. And also feeling empowered that I was able to do this new workout and actually loved it! What in particular did you like about the program you chose? * Keeps you interested! Keeps you coming back for more! The way that Autumn does the workouts in the 21 day fix, made it achievable for me. I didn't feel discouraged, in fact I felt encouraged!!! 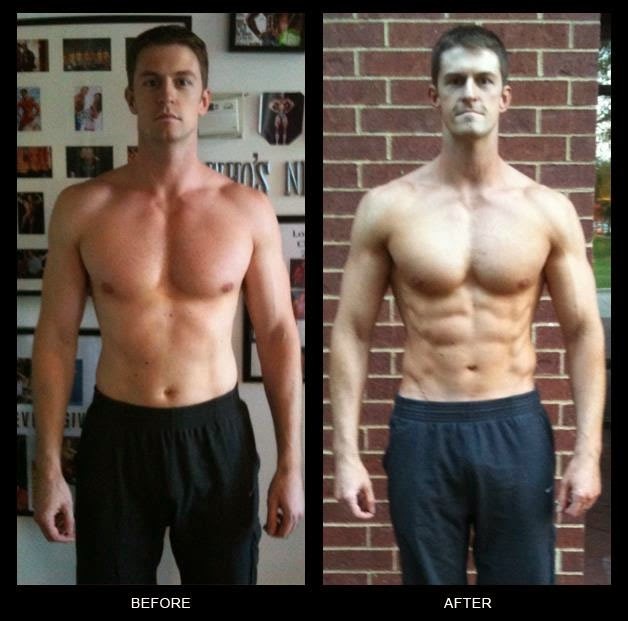 Describe the results you achieved with your Beachbody program. Which achievements are you proud of? * I've lost 87 pounds in 9 months! And im still going!!! How has your life changed since completing your Beachbody program? * I feel alive! I am So happy, and everyday feels like a blessing! I get up everyday and am excited to see what the day has in store for me and my little one. We go on adventures almost everyday! I find any excuse to get out of the house and go for a walk with my daughter, whether its to go the library or the park or the neighborhood aquarium, we just grab the stroller and start walking!!! 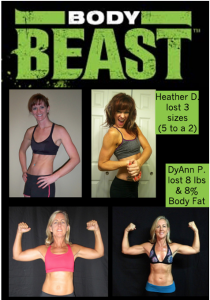 Beachbody has given me a life I thought was lost, a life I could never see because I was in the dark. With the help of beachbody I have found the light! and its brilliant!!! How did a Beachbody Supplement or Nutritional Product or Program affect any existing health conditions you have? I was in chronic pain living with multiple bulging discs, sciatica, fibromyalgia, chronic headaches and insomnia not to mention depression. I was on narcotic pain medication around the clock, I could not function without my meds. Now I do not take any thing at all!!! With the exception of the occasional ibuprophen and multi vitamin, and of course my daily dose of dense super food nutrition!!! shakeology!!! ARE YOU READY FOR YOUR AFTER PICURES??? MAKE ME YOUR COACH TODAY AND LET'S GET STARTED. IT"S FREE!! 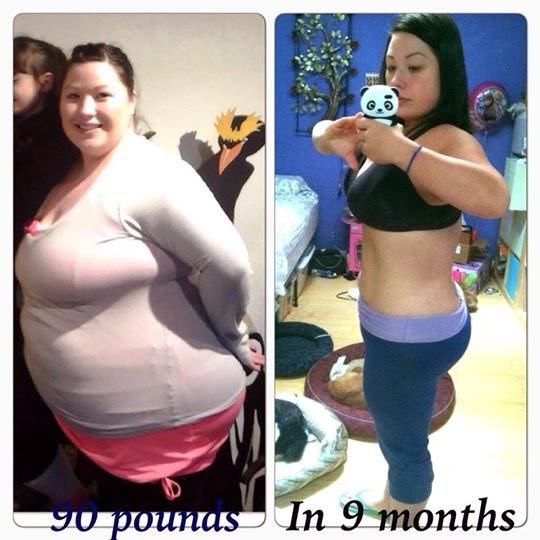 Monday night's featured story, 90 pounds in 9 months! I am thrilled to share Ms. Jessica Vu's transformations story!! Please read below and cast your votes in ASAP for my friend Jessica. She has worked hard. IF YOU ARE READY TO TAKE THE LEAP OF FAITH AND START YOUR OWN WEIGHTLOSS JOURNEY , CLICK HERE AND MAKE ME YOUR COACH TODAY! ITS YOUR TURN. JUST PUSH THE BUTTON!! This grilled chicken dish topped with honey and sautéed apples is delicious whether you're celebrating the High Holidays or just looking for a healthy chicken recipe. 2. Combine wine, mustard, honey, and salt in a small bowl; whisk to blend. Set aside. 3. Brush chicken breasts evenly with 1 tsp. olive oil. 4. Grill or broil chicken for 5 minutes on each side or until chicken is no longer pink in the middle and juices run clear. Set aside. 5. While chicken is cooking, heat remaining 3 tsp. oil in medium nonstick skillet over medium heat. 6. Add apples, onion, and wine mixture; cook, stirring frequently, for 8 to 10 minutes, or until apples are tender and liquid thickens slightly to sauce consistency. 7. 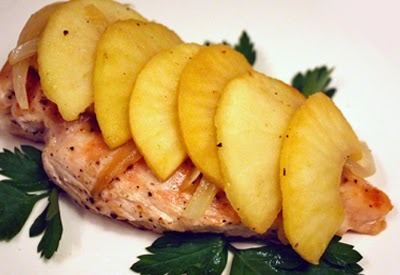 Serve apples over chicken. 3. Press mixture into 8x8-inch baking pan; cover and refrigerate for at least 3 hours. For many of us women, one of the hardest areas to tame is our abs! Luckily, there are excercises to target your specific issue head on! But first, which tummy type are you? These people are likely to lead sedentary lives and have desk jobs or are "couch potatoes." They may also typically have an emotional attachment to sugary foods or alcohol. Eating lots of sugar and refined carbohydrates in products like biscuits, cakes and white bread, or rely on starchy carbs like white pasta noodles and white rice. Cut down on alcohol. ‘Alcohol turns into pure sugar once consumed and goes straight to your waist. It also stops you from burning all other fat until the booze has been processed. 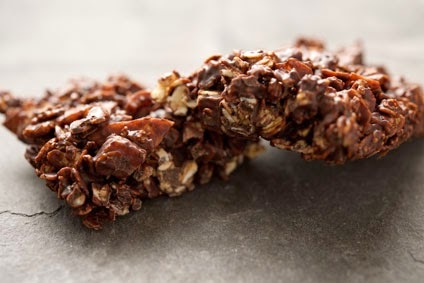 Avoid low-fat and so-called ‘diet’ snacks. These pre-packaged products are often packed full of chemicals, refined sugar, salt and preservatives to give them flavor. Eat cleaner. Rely on a healthy diet full of unprocessed fresh foods such as fish, eggs, organic meat and vegetables. Move more. If you work a desk job, park far away in the parking lot or start taking the stairs instead of the elevator. Use your lunch breaks to go for a walk as you eat. Exercise. Simply going for a long walk, doing lunges, squats or dips at home or a yoga class will be beneficial. You don’t need a gym. Typically over-achievers with perfectionist personalities. Usually also susceptible to digestive conditions such as irritable bowel syndrome (IBS), which can cause bloating and make their tummies look far worse. Weight is specific to the front of the midriff and the umbilical area. When stressed, we produce cortisol, a hormone which encourages the body to cling on to fat around the stomach. This type of tummy will also be fairly hard to the touch, rather than wobbly. Grabs junk food for convenience. Go to bed earlier and sleep more. Lack of sleep disrupts the production of leptin, the hormone which helps regulate appetite and metabolism. Relax. Try deep breathing exercises, meditation, and long baths before bed to encourage a good night’s sleep. Limit coffee consumption to no more than two cups a day. Try calming exercises such as yoga, long walks, swimming, or resistance work. Stress-busting stretches and yoga poses at night time can help to lower cortisol levels. Try chamomile tea at night as well. Likely to be busy moms or have demanding careers. They may even be a gym junkie, but stuck in a workout-and-diet rut, perhaps always eating the same foods and doing the same routine at the gym, which keeps you slim but leaves you with a lower belly.. Doing excessive crunches and using gimmicky gym items such as ab-rollers can place a strain on the hip flexors and the lower back, causing the tummy muscles to protrude so your belly sticks out. Good nutrition and plenty of fiber are essential to improve digestive conditions such as inflammation, bloating and constipation, which can make a pooch tummy worse. 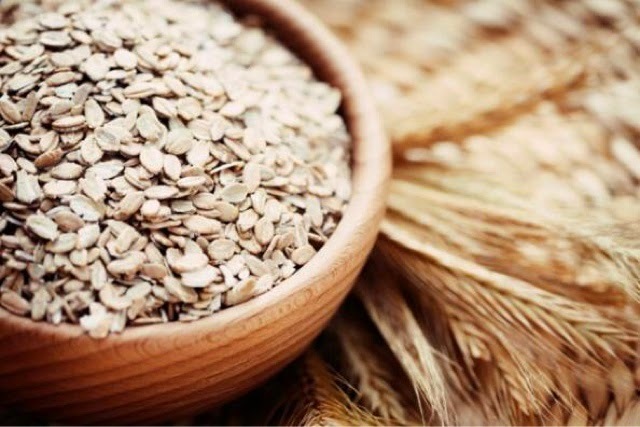 Green leafy vegetables, oatbran and wholemeal grains are good, natural sources of fiber. Reduce inflammation by drinking lots of water and eating easy-to-digest foods such as green vegetables and lighter proteins such as fish and chicken. Women with these tummies have usually given birth in the past few years, and, being a typical mom, have little time for themselves. Rushing back to exercise too quickly or overdoing it. 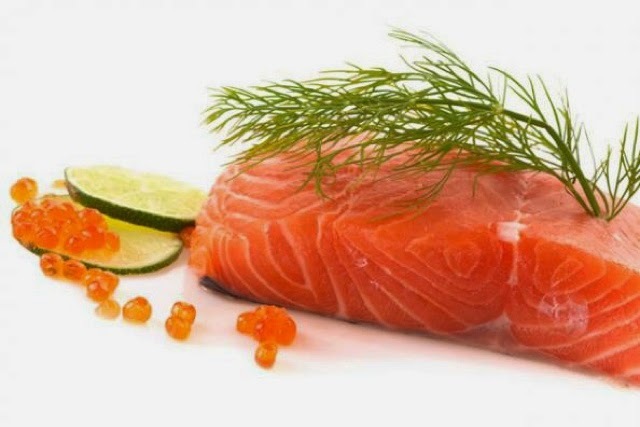 Fish oil supplements turn on fat-burning hormones and turn off fat-storing hormones. Begin by taking three 1,000mg capsules a day with meals and build up to five, with permission from your doctor. Try to eat good and healthy fats — found in sources such as nuts, oils and olives — every day. Not only do they help you burn fat and absorb vitamins from food effectively, they also help combat tiredness — a big help for tired moms. Steer clear of sit-ups. After giving birth, the linea alba muscles — which run down the mid-line of the abdomen — separate and you need to allow them to recover. Crunches are the worst thing you can do, as they will force these muscles farther apart. Instead, breathe deep into your tummy while on all fours, then slowly exhale while doing a pelvic floor exercise. Bloated tummies are often flat in the morning, but swell throughout the day with gas or indigestion. It is almost always caused by food intolerances and allergies, or sluggish bowels as a result of a poor diet. The most common intolerances wheat and gluten (bread, pasta, pastries, pizza, cakes and cereals). Gluten can inflame the bowel and make the stomach look bigger. The key here is to experiment to work out what bothers your belly as you know your body better than anyone else. Try eliminating key culprits such as gluten for a fortnight to see if your bloating reduces, or worsens when you reintroduce foods. Bloating can be a sign of imbalanced gut flora. So to get your tummy really flat you need to repopulate it with friendly bacteria. Prebiotic and probiotic supplements are the simplest way. Natural sources include miso soup, sour cream and some fruit and veg including kale, garlic and onions. Believe it or not, breathing can be the best thing you can do for this kind of tummy. Try this each morning: lay on your back, completely relaxed, and breathe deep into your tummy ten times. After eating, a walk will help the digestive process, too. Always keep moving. Preheat oven to 475°F. Drain farro and transfer to a medium saucepan with 11⁄2 cups water. Bring to a boil, cover and reduce heat to medium-low. Simmer for 10 minutes, until tender. Drain excess water. Meanwhile, in a large nonstick skillet, bring 1 inch water to a gentle simmer. Add zucchini and cook until slightly softened, about 5 minutes. Remove zucchini from skillet and with a small spoon, scrape out and reserve flesh. Place zucchini skin side down in an 8 x 10-inch baking dish. Drain water from skillet and wipe dry, then heat on medium-high. Add turkey and cook, breaking up with a wooden spoon, for 2 minutes. Add onion, oregano and reserved zucchini flesh and reduce heat to medium. Sauté, stirring often, until turkey is almost cooked through, about 5 minutes. Stir in farro, tomatoes and vinegar and sauté for 2 to 3 more minutes; stir in 3 tbsp basil. 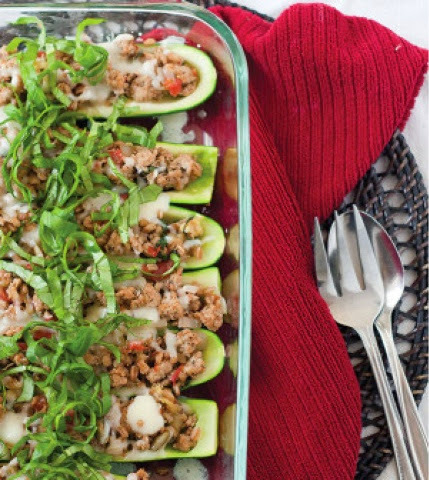 Spoon mixture into zucchini halves. Top with pepitas and cheese and bake for 5 to 10 minutes, until cheese melts. Garnish with additional basil. TIP: Didn’t soak your farro overnight? Simply cook as directed, but simmer for 20 more minutes. Click here and answer a few questions and I will get you connected to the group. The must eat proteins, carbs and fats for packing on the muscle without adding a gut. Bulking up your frame with ample muscle and minimal fat is a combination of increase your training volume and your calories. Just as doing leg extensions won’t add muscle like doing squats, eating the wrong foods won’t get you the muscular lean body you desire. Easy healthy bulking is all about eating an excess of the right quality foods that will minimize fat gain, maximize muscle growth, while keeping your joints, heart, and metabolism functioning in top shape. While bulking you want to shoot for eating 30% of your calories from protein. This will ensure that you're providing your body with enough amino acids for new muscles construction but not too much protein that you’ll be displacing other important foods in your diet. Each of the below sources provides unique nutrients or flavors giving your body what it needs while preventing you from getting tired of the same old food (anyone who has been on the boiled chicken breast and canned tuna diet will know what I’m talking about). A great calorie dense late night protein source that is packed with omega-3 fats which will help fight inflammation and keep your joints pain free as your training volume increases. Classic muscle building foods that can be cooked 100 different ways giving you’re the protein you need and variety to keep you sane. Chicken thighs are a nice alternative to chicken breasts; the dark meat has a smoother texture and taste that comes from the added fat which in addition to giving extra flavor, gives you extra calories for your muscle building efforts. 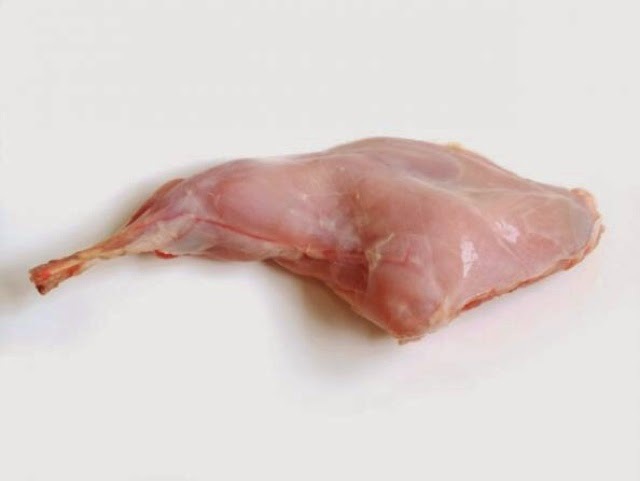 Choose cuts of meat labeled loin or round and trim away any visible fat before cooking to ensure a high quality protein source with the right amount of calories. 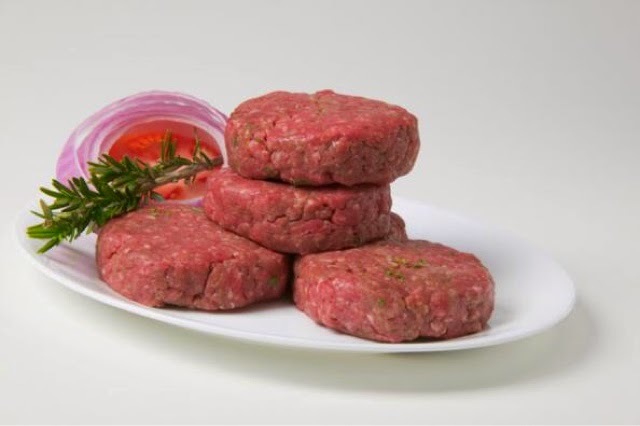 Lean beef or bison is a natural source of creatine and one of the best sources of stearic acid, a unique saturated fat that has no impact on your cholesterol level. Getting ample starchy carbohydrates first thing in the morning and in the 3-4 hours following your training session is an essential strategy for getting the calories your need and putting those calories to work building muscle instead of having them pad your waistline. A grain originally from South America, quinoa can be eaten warm or cold, for breakfast (like oatmeal), lunch, or dinner. 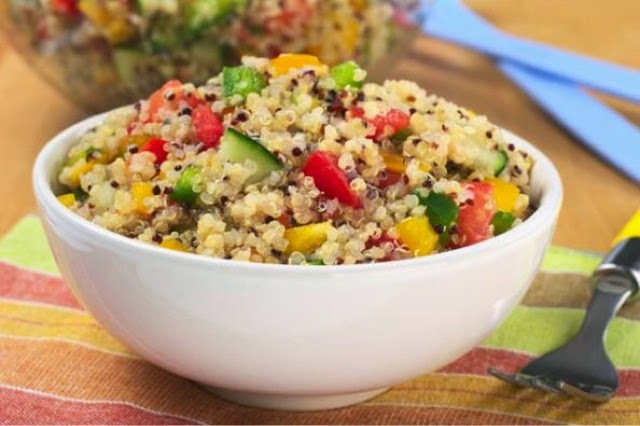 Quinoa has a higher than usual protein content for a grain and one serving also packs 33% of your daily zinc needs, a nutrient essential for optimal testosterone. Oats are an extremely versatile grain that you can use to easily bump up your calories without stuffing yourself. Rolled oats can be eaten as oatmeal for breakfast, blended into a smoothie, or mixed together with chocolate protein powder and peanut butter for a muscle building sludge that can be packed up and taken with you to enjoy when you are on the go. 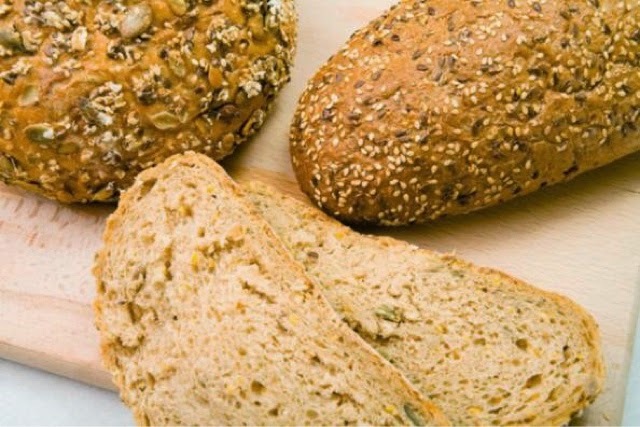 Sprouted grain breads provide you a better alternative to regular breads. Sprouted grain breads are made from grains only after the grain has sprouted giving them a lower carbohydrate and higher protein due to the conversion of carbohydrates to protein during the sprouting process. Sprouted grain breads also have a lower glycemic index than traditional breads. This translates to better blood sugar control for your body. Better control of your blood sugar while bulking will result a better muscle:fat ratio. Sprouted grain breads, like Ezekiel bread, aren’t packed with preservatives so keep them in the freezer until you are ready to eat them to prevent premature mold growth. with more than twice the calories per gram than protein or carbohydrates making it easier for you to hit your higher than normal calorie targets. Your body also creates hormones and other important signaling molecules essential for muscle growth and good health from fats. 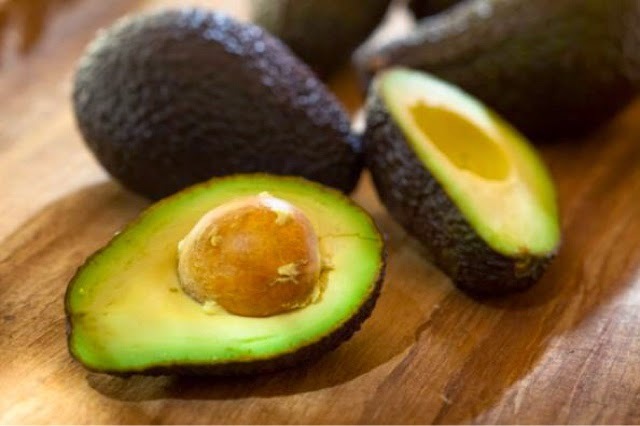 Avocados contain high levels of monounsaturated fats which a 2007 study published in Diabetes Care showed switching to a diet high in monounsaturated fats can prevent the redistribution body fat towards your abs. This will help you keep your midsection tight while your get bigger. Avocados are also a great way to get extra fiber in your diet without filling you up. 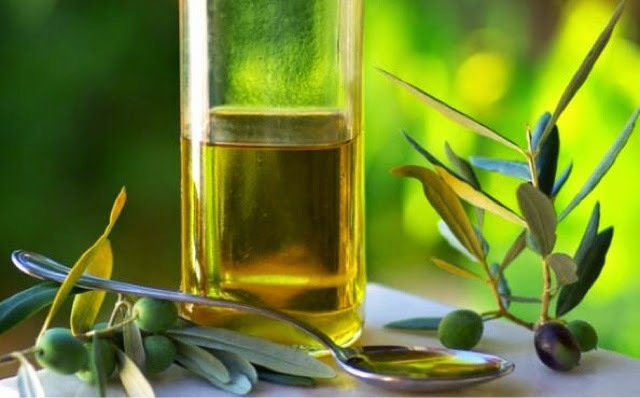 Cold pressed extra virgin olive oil should be a staple in your diet, used in cooking a low temperatures and drizzled on salads and other vegetables throughout the today. In addition to being packed with heart healthy fats, extra virgin olive oil is loaded with polyphenols. Polyphenols are a power class of antioxidants that will help keep the oxidative stress created by your intense training sessions in check so you can continue to train and grow at your max. If your olive oil has a peppery taste, then you know it is full of polyphenols. Coconut milk is your magic muscle building bullet. Its versatility allows it to be added to sautéed spinach, protein shakes, or a bowl of Greek yogurt to near instantly boost the calorie content of any dish without you feeling like you are eating more. 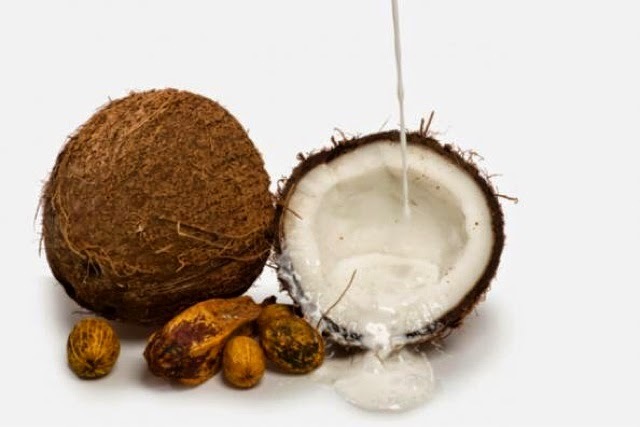 In addition, coconut milk contains medium chain triglycerides (MCTs). MCTs are saturated fats that are absorbed and digested differently than the other fats in your diet making them more readily available to be used for energy and not stored as fat. 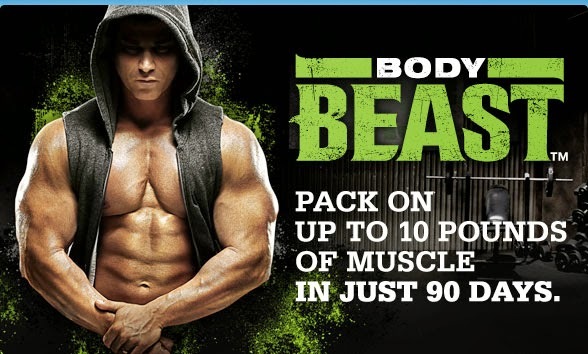 Need help bulking up and gaining Muscle Mass? Register today to get into the Swole Shack! Click the image below and sign up for your FREE account. I will contact you after the form is submitted and together we will pick the program that is best for you and your bulking needs. 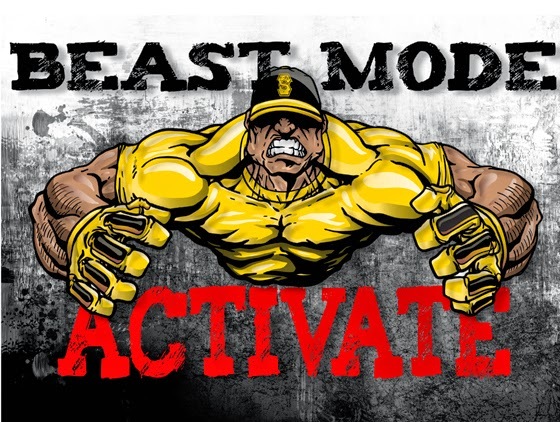 ITS TIME TO GET SWOLED!!! You wanted to see Tania's “before” and “after,” so here they are! 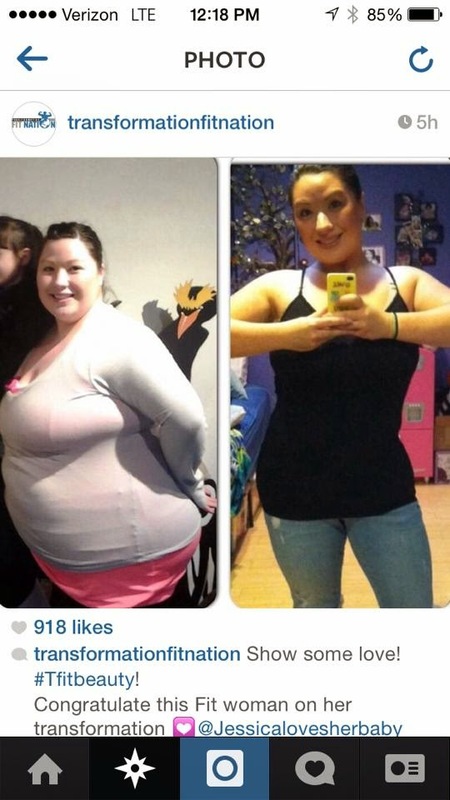 Yes, she got these results in just 10 weeks with FOCUS T25®! Now she's back to being "The Machine.” If she can do it, post-baby, so can you! JOIN MY NEXT GROUP TODAY!